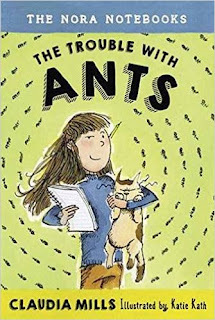 I love ants - so I could not wait to get my hands on this first in a new series by Claudia Mills. Because who can resist a story about a fourth-grade myrmecologist which features loose ants, a skunked dog, and that dreaded assignment to write a persuasive essay. The book begins: "Nora Alpers woke up early on New Year's morning and reached for the handsome, leather-bound notebook she had gotten for Christmas." She could use it for a diary, suggests mother. She could write stories in it, suggests her sister. She could write poetry in it, suggests her brother. But no - Nora plans to scribble interesting facts about ants. Right now, in fact, she's investigating whether ants dig faster in wet sand or dry sand. I love that chapters end with ant colony observations. I love that random animal behavior facts show up in unlikely places - like how fourth-graders sort themselves into various groups in the cafeteria. And I love the details about making your own ant farm using ants from the back yard (don't do this with fire ants!). Mostly I love that author Mills doesn't shy away from complex language. She calls ant scientists by their name and figures that kids will figure their way through all five syllables. Oh yeah - and there's a real story going on, too, in spite of the ants. But....will Nora submit a paper about her ant research to Nature? Will she solve the mystery of disappearing ants? And will she be able to convince her friends that ants are cool? Find out the answers to these questions and more in your very own copy of the book, because I'll be re-reading mine. IF you've got some ants living around your neighborhood, try out these experiments I wrote up in an article for Ranger Rick back in 1998 called "Invite Ants to Lunch". Today is Marvelous Middle Grade Monday and we're hanging out with other MMGM bloggers over at Shannon Messenger's blog. Hop over to see what other people are reading. Review from ARC provided by Blue Slip Media. Another book I would choose by its cover! When the book opens it's time to paint the house. Problem is, Vincent can't decide what color to paint it. 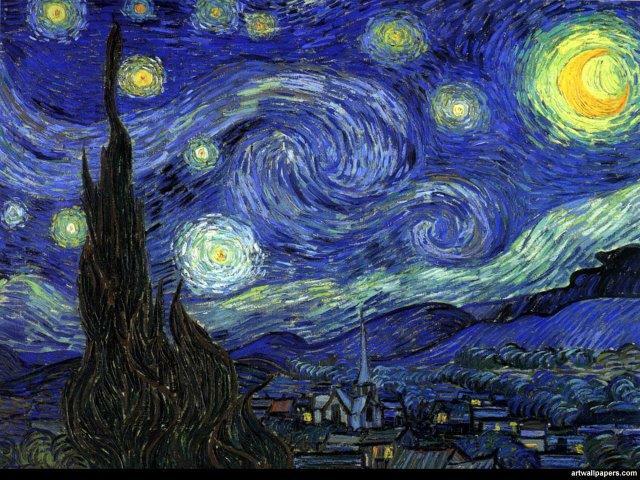 "Maybe I will just paint it white," said Vincent. ..."Stop!" said the spider. "This is my house and I like red." Vincent agrees that red is nice, but then caterpillar butts in and says it's his house and he likes yellow. Yellow is nice too... but animal after animal insist that the house be painted a different color. What's a post-impressionist Dutch painter to do? What I like LOVE about this book: It's fun. Entertaining. Educational. 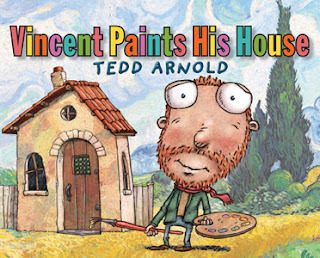 I love that when Vincent says he'll "just paint the house white", the colors on his pallet include snow, ivory, titanium, and cream. Yellows include amber and ochre, reds everything from peach to cadmium, and blues include my favorite: cyan. I love that he visualizes his newly painted house as part of one of his paintings, and that as he paints he gets blobs and drops of color on his shirt, jeans, beard.... And I really love the last page: an homage to Starry Night - but featuring his humble abode instead of the town. And did I say I love the cover? Go on a color field trip. Head to a store that sells paints and look for the displays with paint color samples. It's fun to see how many colors of white they offer, or yellow, blue, green. Collect a rainbow (if you can). White isn't called "white" - it's oatmeal or eggwhite or cream. What cool names are there for colors? Then go on a field trip outside and see how many different shades and hues of each color you can find. You might want to take a camera. Mix up some colors and paint your own house - but on paper. Draw a picture of your house and paint it. What color - or colors - would you choose? If you can't find the right color, mix up one of your own. Check out some historically painted homes, or these houses. Learn about Vincent Van Gogh. You have probably seen his paintings in books - or even a museum. Check out this gallery of his paintings. And if you have a chance to look at one of his works, take a close look at his brush strokes and a distant look at how the colors come together. The cat wants another cat to play with. Looking out the window he sees what looks like a cat's tail. But no - it's the handle of an Elf's umbrella. And the elf is looking for some rain so he can test his umbrella. Look... droplets of water falling from the sky. Could it be rain? Nope. It's a bear crying on the roof. Crying because he lost one of his boots. But wait! could that be his lost boot over there? Nope. But welcome to this crazy story where everyone is looking for something and just when they think they find it, they discover it's something different. It is one wacky chain of events that just might inspire youngsters to look at their world with a bit more imagination. But wait! Isn't this the same author who, just last spring, had us hunting for pirates? OK, I confess: this is a book I would choose by its cover! He has a plan. He uses sticks. Crow wants a friend, and since there's no other crows around he sets about making one. He tries sticks, but they don't work. He tries building a friend out of snow, but snow friends only last so long. Then he hears "Caw! Caw!" and he makes a new plan that works out much better. In the end crow is surrounded by friends. 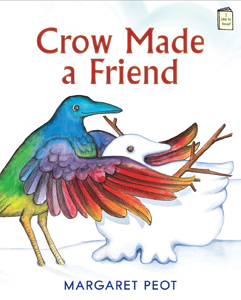 What I like about this book: I like the simplicity: crow wants a friend and so he makes one. I like the seasonality: in the fall he uses sticks; in the winter he uses snow. I like that he tries to solve problems in a crow-like fashion, and that the materials he uses are things that a crow would find in nature. And I like love the way it ends, when crow puts his building skills to a different use: making a nest for his new friend. And did I say I love the cover? I also love the play on words in the title. And the language is simple enough for beginning readers, and yet engaging enough that I would read it aloud to a child as a picture book. Make a pocket friend. You probably have all sorts of things around the house that you could use to make a "friend": un-matched socks, felt, clothespins, yarn, scraps of fabric. If you like to use needle and thread, try making a sock friend. But if you're more the glue-it-and-be-done-with-it sort, then maybe a clothespin person would be the friend for you. Be creative. Have fun. Be a friend to people and other living things. Two years ago a girl in Seattle started feeding the crows in her neighborhood. Now her crow friends bring her presents when they visit. Crows are smart; they can use tools and build things, and they can tell when someone is a true friend. How can you be friendly to the birds who visit your backyard? How can you be a better friend to your pet? The legend of Rainbow Crow. The crow on the cover of the book has feathers the colors of a rainbow. And that reminded me of a tale from the Lenni Lenapi people about Rainbow Crow. Rainbow Crow was a true friend to the other animals - you can read his story here. And if you look at crow feathers in sunlight, you can still see the rainbow. I love it when stories begin on the end pages. Open the cover and you see a gentle scene, with mom and child placing a hot pie on the windowsill to cool. Without even reading the story, we know there's gonna be trouble. It's all about that pie. Big Chuck (he's a woodchuck - which, if you know anything about woodchucks, means he's nothing but trouble....) can see that pie. He can smell that pie. But he cannot reach that pie. ... and fail. Until Big Chuck gets a big idea. I won't say what happens, but this last sentence should give you a clue: "Pie for everyone!" The wordless spread on the back end pages allows readers to fill in the rest of the story. 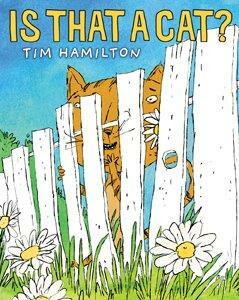 This book, with its lovable but zany characters, should entice even reluctant readers to open the covers. 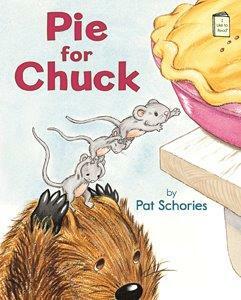 Because who doesn't want to read about a pie-stealing critter who outsmarts the mom? And it opens the door for sharing stories about when you were little and wanted to reach the popsicles in the freezer, or how your mom thought that hiding cookies on the tip-top shelf would keep them safe. Or maybe your child is more technically inclined. Perhaps, if he were in charge of the story he'd have woodchuck build a catapult or some sort of pie-snitching crane? Grab some paper and markers and challenge your child to design different ways to get a pie off a ledge. Tell a few jokes or riddles, and then when you stop laughing, pull out the book where you got them. Maybe your kid wants to read a joke. Does your child want to learn magic? Make a car out of a mouse trap? Introduce him to "how to" books for things he wants to do. The New York State Libraries have a wonderful online resource for early readers. It's called the "Day by Day NY Family Literacy Calendar". One more story - a new book each day that your child can read along with. The words are highlighted as the narrator reads the story. Tumblebook of the day - an audio picture book with phrases highlighted as the narrator reads them. Just click on this purple button in the right hand column of the blog (underneath Nonfiction Monday). Have fun! It's breakfast time, but the eggs are too old to eat. Not only that, they're moving. Next thing you know, they've hatched and the unnamed main character has half-a-dozen baby dinosaurs on his hands. They're cute. And they're hungry. And if mom sees them ... uh-oh. Here she comes. Whew! she thought they were toys. The problem is: how do you hide dinosaurs? When they're small it's easy - stuff them under the bed. But what about when they get too big to fit under there? You can only keep your mom out of your room for so long... and eventually she'll find out. what would you feed these dinosaurs? how fast will they grow? and how big will they get? will they make noise and disturb the neighbors? To find answers to those questions, you'll need to go on a field trip to the library. Check out the nonfiction section (567's) and also look for some picture books that feature dinosaurs (How do Dinosaurs eat their food? say goodnight? go to school?). 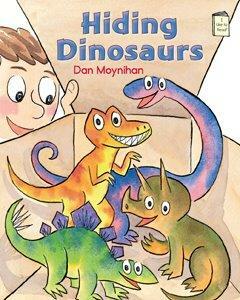 Draw a picture of a dinosaur, or make some dinosaur finger puppets to be your reading buddies. Click here for some more tips on how to get your child to love reading (from Reading is Fun) - and check out yesterday's post for more reading tips. Last week a mom came into the library and asked, "How can I get my child interested in reading books?" Great question. So this week I'm doing something different. Every day I'll feature a hot-off-the-press easy reading book plus some reading resources. Except Wednesday. Wednesday will be a surprise. One look at the cover and I know this is the story for me. When we were kids, dad would take "shortcuts" that invariably got us lost. 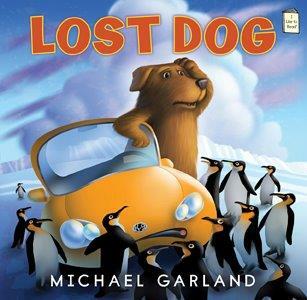 Not only that - how does a dog driving a car end up surrounded by penguins? You have to be really lost for that to happen. Pete is just a normal, happy-go-lucky dog who wants to deliver a present to his grandma. But there's a traffic jam, so he decides to take the back route. Only... he gets lost. Along the way he encounters various animals who point the way to grandma's house - but their directions just take him farther away from where he wants to be. And yes, there are penguins. Finally, Pete makes it back to town where Officer Bark (a German Shepherd police dog) helps him find his way. All's well that ends well, and the wordless endpapers show granny opening her gift. The language is simple, the text large, and there's a lot of repetition of "That way," said the fill in the animal. But it's also plain fun to read - because, you know, anyone can get lost when trying to take a shortcut. This is the sort of book that, after reading, you might say, "hey, remember that time when..." and launch into a family story about a shortcut-turned-long. Or maybe you have an aunt or uncle who has a lousy sense of direction and always gets lost. Sharing stories is a fun way to generate interest in reading. Invite your child to read with you every day. When reading a book with large print, point to each word as you read it. That helps your child understand that reading goes from left to right, and that the word on the page is what you say. Read your child's favorite book over and over (and over!). Read lots of stories with rhyming words and repeated lines. Children love to "read" along with those parts - and you can point to the words while you say them together. When you come across new words, talk about them. Stop and ask about the pictures, and what's happening in the story. Let your child "catch you" reading for pleasure. Our family had a "reading time" when everyone grabbed a book and a mug of cocoa (or icy lemonade) and we read for half an hour. These strategies and more can be found at the US Dept. of Education, where you can download their publication, Reading Tips for Parents. The Peabody Elementary School Talent Show was an annual tradition. All of Penny's classmates were participating. Everyone, that is, but Penny. She can't sing or dance, so she needs to come up with a talent. What I like about this book: I love the way that Penny attacks her problem. She begins by listing her top five talents: tuba playing, juggling, yodeling, baton twirling, jump roping. Then she practices ... and one by one crosses things off her list. So she tries other things. Penny makes lists and more lists, until finally everything is crossed off. What talent can she possibly have? Throughout it all, her faithful friend and companion Jelly sticks with her. What talents do you have? Do you sing or dance, play the kazoo, draw pictures, write stories, design cool costumes? Maybe you drum rhythms on buckets or grow a garden. Everyone has talents - the trick is recognizing them. Learn something new. A lot of people think talents are things you're born with: artistic ability, or athletic ability. But you are amazingly adept at learning new things. So try something you've been wanting to do... like singing. Or dancing - you can start with the Chicken Dance! Embrace friendships. Penny and Jelly are best of friends. They don't speak the same language and they look completely different, but they understand one another perfectly. People and dogs aren't the only ones who share interspecies friendships. Check out these unusual animal friendships. Check out the story behind the story. 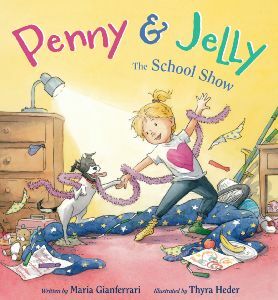 This summer, Maria Gianferrari wrote about the inspiration for her book, Penny & Jelly. You can read it here, at Miss Marple's Musings. Keep your eyes peeled for her next book, Penny & Jelly Slumber Under the Stars - coming out in the spring.